I can’t believe I haven’t posted this recipe before. I make this for dinner all the time, probably 2 or 3 times a month at least. It’s so easy and fast, but it’s more interesting than pasta with tomato sauce. Again, this is another one from The America’s Test Kitchen Cookbook. One day I will probably run out of recipes to make from this book, but by then there will hopefully be a new volume. 2. Meanwhile, combine the ricotta, Parmesan, butter, 1/4 tsp salt, and 1/2 tsp fresh ground pepper (we use more than this-I like it with a lot of pepper!) in a big bowl. It has to be big enough to hold all the pasta. 3. Cook the prosciutto and oil in a frying pan over medium-high heat until it’s browned and crispy, about 5 minutes. (The original recipe says nonstick 12″ skillet, but I don’t usually do that). 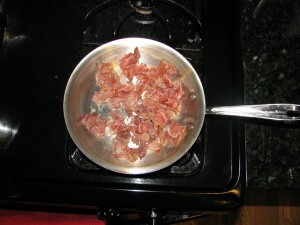 Transfer the prosciutto to a paper towel-lined plate and leave the oil in the skillet. 4. Add the onion to the oil in the skillet and cook over medium heat until the onion is softened, about 5 minutes. Add the garlic and cook until fragrant, about 15 seconds. Stir the onion mixture into the ricotta mixture in the bowl. 5. When the water is boiling, cook the pasta according to the package directions. The last 30 seconds of cooking, pour in the frozen peas. 6. Reserve about 3/4 cup of the cooking liquid from the pasta before draining it (sometimes I skip this step, and it’s still good just thicker). Whisk the lemon juice and 1/2 cup of the cooking water into the ricotta mixture until smooth. 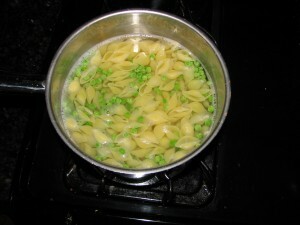 Add the shells and peas, and season with salt and pepper to taste. 7. Add the remaining pasta water as needed to loosen the pasta before serving. 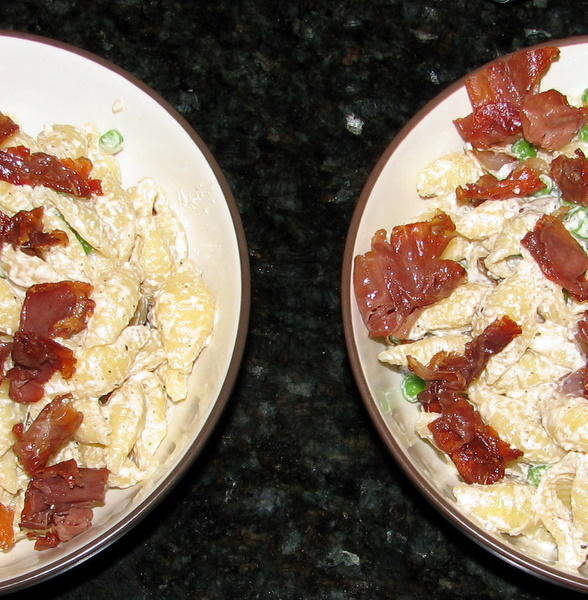 Sprinkle the crisp prosciutto over the pasta when serving.